2017 (like 2016 - 2013 before it) sees another year of the Slovaks licking their wounds and trying to work out just exactly how they are ever going to not finish last. "There's a refreshing absence of McDonald's-style commercialism that is rampant across Western Europe. 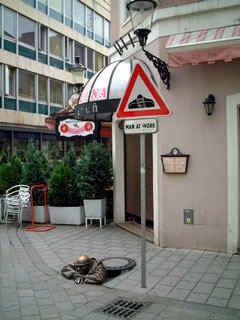 Quaint and jovial with a surprisingly rich cultural life, Bratislava is a capital city without the usual congestion. The High Tatras are a magnificent range of mountains dotted with villages with deep peasant traditions. You'll find Slovaks to be an extremely helpful, pleasant people prepared to go out of their way to welcome you. From folk festivals, to castle tours to snow boarding and hiking you'll find Slovakia a spectacular country to visit." Not only is Bratislava the largest city in Slovakia, it also serves as the state capital. Furthermore, Bratislava is the seat of the National Council of the Slovak Republic, the Government of the Slovak Republic, national ministries and the other central bodies of the state administration of the Slovak Republic. 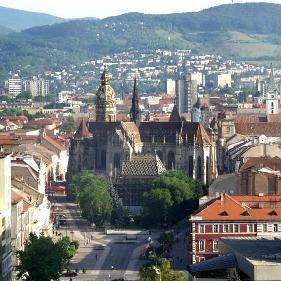 It is situated in the centre of Europe in the southwestern part of Slovakia. It borders with Hungary in the south and with Austria in the west. 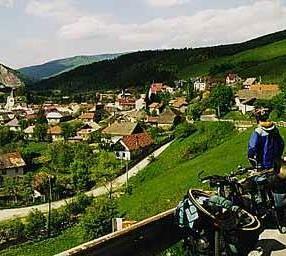 The town spreads like a fan on both banks of the Danube River, and at the foot of the Low Carpatians at. Due to its position on the border between the mild and warm climatic zones, it ranks among the warmest spots in Slovakia with an average temperature of 9,9°C". A Slovakian man estimates he's eaten more than 11,000 chickens since being diagnosed as a diabetic 30 years ago. Jan Csovary has chicken for breakfast, lunch and tea. He started eating it after reading about foods diabetics can safely eat and finding the only thing he liked was chicken. But he has to do his own cooking after his wife said she was sick of the sight of chickens 20 years ago. He said: "Once I started eating chicken I really got a taste for it, and even now 30 years later I can't get enough. "I feel as fit and healthy as I did when I was diagnosed with diabetes, and I'm now 70 years old." Mr Csovary from Prievidza says cream of chicken soup has been on the menu every day. He said: "I'm a great cook, as long as it's chicken soup. I can make a different variety for every day of the week." Slovakian farmers are blaming nuclear fallout from Chernobyl for turning their sweetcorn into "M&Ms". Monika and Stefan Regec, from Gana, near Galanta, say their sweetcorn tastes of chocolate and has turned multi-coloured. "We planted regular corn seed just to fill an empty patch in our little garden. We had no idea that when we harvested it and took off the leaves, pods of such bright and varied colours would be revealed." Now the Regec's storeroom is full of red, brown, grey, blue and green corncobs. Others are pearly white, orange, and even black. "When we cooked the brown corn the kids said it tasted like M&Ms. We made necklaces out of some of the pods as well," Monika Regec added. The Regec family believe that nuclear fallout from Chernobyl that left radioactive waste in much of the area is to blame for the different coloured corn. A Slovak man trapped in his car under an avalanche freed himself by drinking 60 bottles of beer and urinating on the snow to melt it. Rescue teams found Richard Kral drunk and staggering along a mountain path four days after his Audi car was buried in the Slovak Tatra mountains. He told them that after the avalanche, he had opened his car window and tried to dig his way out. But as he dug with his hands, he realised the snow would fill his car before he managed to break through. He had 60 half-litre bottles of beer in his car as he was going on holiday, and after cracking one open to think about the problem he realised he could urinate on the snow to melt it, local media reported. He said: "I was scooping the snow from above me and packing it down below the window, and then I peed on it to melt it. It was hard and now my kidneys and liver hurt. But I'm glad the beer I took on holiday turned out to be useful and I managed to get out of there." Rail staff in Slovakia found a human leg stuck to the front of a train that had travelled hundreds of miles across eastern Europe. The leg was discovered at the Zilina train station in northern Slovakia attached to an express train that had arrived from the Polish capital, Warsaw. Police said the limb "probably" belonged to a man who had been hit by the train as it travelled through Poland. The train was four hours late following the accident. Spokesman with the Slovak Railway Police, Jozef Buransky, said the leg would be stored at a local hospital until the victim's family requests it back. He said: "It's up to them whether the leg returns to Polish territory so that it can be buried with the rest of the man's body." 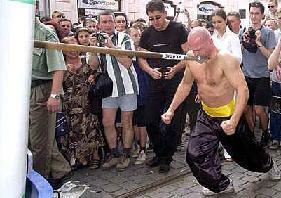 A Slovakian man has pushed a 16-ton tram car 250ft using a pole attached to his Adam's apple. Robert Mikula says he carried out the feat using his vital inner energy to stop himself turning into a lethal weapon. It was the martial arts expert's third attempt this year and comes a year after a Hungarian died doing the same challenge. The 28-year-old tried to get the feat entered into the Guinness Book of World Records, but was told it was too dangerous to be recognised. Mr Mikula said: "It took lots of energy out of me and the first thing I felt when I finished was thirsty." He now intends to try pulling a 60-ton boat over the same distance by pulling it on a chain held between his teeth.